So, we've seen barely any attempts to roll over while she's playing on her blanket. She kicks her legs a lot but no sideways action ever, ever, ever in the day time...maybe once, perhaps. 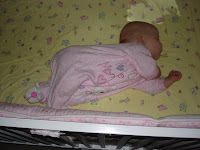 So we've been asking her if she'd like to roll over and we practice going from her back to her front. Yeah, she's not feeling it, ever. She's not super fond of tummy time. She does great until she realizes that her hands are as accessible on her stomach as on her back so when the mouth finds the hands her face is just down in the blanket and there is no return. Well, I came home from work today and Sierra was in a great mood, as always (thank you Babywise) when I got her up from her nap. She shrieked a bit at us while I did some unwinding with her and Joe, and then she and I went to the living room to play. She was lovin' life (yes, that means she was naked, except for her diaper) and enjoying her naked feet. Well, I was just sitting there watching her, not interferring in all the fun she was having, and all of a sudden, her feet went up to her hands, she turned on her side, then she put her legs in a scissor kick, put one arm down by her side, and rolled over! My little baby rolled over all by herself! She turned to face me and got the biggest smile on her face! I was the first one to see her roll over! I was afraid I would miss all the "firsts" when I went back to work. Oh my gosh, it was so awesome! I got all teary (i'm a nerd, I know) but it was awesome! So Joe runs out of the bedroom, camera in tow, trying to catch her on video with her new trick and she just laid there staring at him. 45 minutes later we put her in her crib to see if she'd do it and sure enough we go this video, the 2nd time rolling over. Gosh she's cute! My baby girl is all grown up!